The best accessory that you can wear is your smile. This is why you need to take care of your oral hygiene properly so you can show the world that beautiful smile. Most importantly, a good oral hygiene will also protect you from health problems that may arise due to poor personal hygiene. The right toothbrush can help maintain your oral health and prevent bacteria, as well as bad breath. 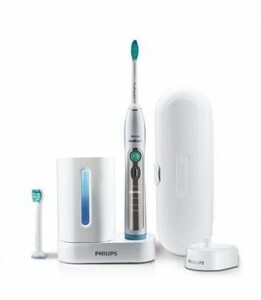 Philips Sonicare Flexcare with UV Sanitizer HX6992 is one of the best choices around. This is an electric sonic toothbrush that can be recharged and comes with a UV Sanitizer. Philips Sonicare Flexcare with UV Sanitizer HX6992 is for those who would like to improve their oral health and prevent oral diseases such as bad breath, gingivitis and tooth decay. Because of its vibration, it removes plagues better than a manual toothbrush. This is also a good option for those who have problems brushing their teeth properly like people suffering from arthritis. This is for kids and adults as it comes with two sizes of brush heads. One is the standard size and one is a smaller one, which is designed for hard to reach areas, though it can also be used by a child. Those who worry about bacteria building up on their toothbrush would be glad to have this because of its UV Sanitizer that also acts as a charger. This electric toothbrush comes with five brushing modes, which you can choose from depending on your needs. They are clean, gum care, refresh, sensitive and massage. The clean mode is for whole mouth cleaning, the massage mode stimulates the gums, the sensitive mode is for those with sensitive gums and teeth, the refresh mode is to quickly freshen breath and gum care is for improving the gum’s health. Its UV Sanitizer can kill up to 99% of bacteria on the toothbrush head, which accumulates when brushing your teeth. Place your toothbrush heads on the sanitizer and within 10 minutes, it is already free from bacteria. Battery life can also last up to two weeks before recharging. It is lightweight making it convenient to carry around. It has long battery life so you don’t have to charge that often. It comes with two brush head sizes to clean even those hard to reach areas. Its UV Sanitizer ensures that your brush heads are free from bacteria. The timer ensures that you are spending ample time cleaning all areas of the mouth. It has different modes, which makes it a great choice even for those with sensitive gums and teeth. It comes with a hard plastic case instead of the soft ones that came with the other models. This entry was posted in Reviews and tagged Flexcare, Philips, Sonicare, UV Sanitizer on July 21, 2013 by admin. Tree Kangaroo Facts – Why are they declining?